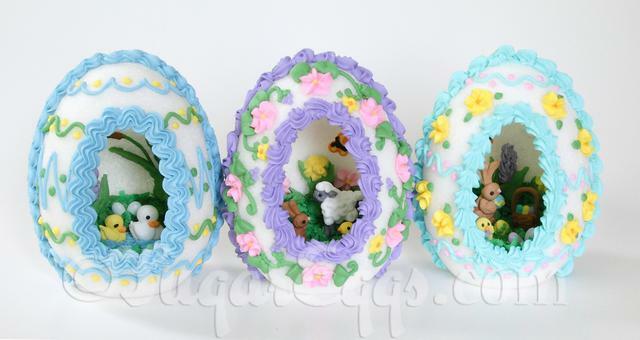 Panoramic Sugar Eggs come in three sizes, small, medium, and large (shown together above). They also come in several styles, Upright (Standing) Panoramic, Traditional Panoramic (horizontal with window in the small tip of the egg), Panoramic Side-view, & Candy-dish eggs. Scroll down for examples and pricing; Click any image to enlarge to see detail. 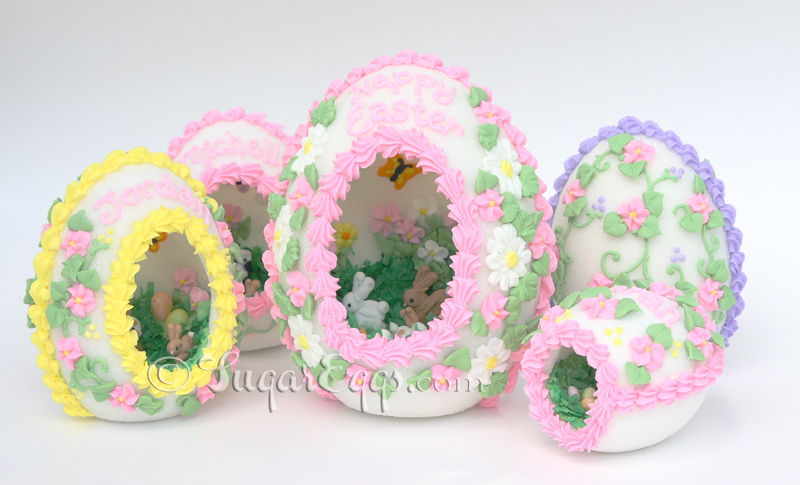 Small Sugar Eggs ~ Shown above in the Traditional Panoramic Style. 3.5"-4" in length. 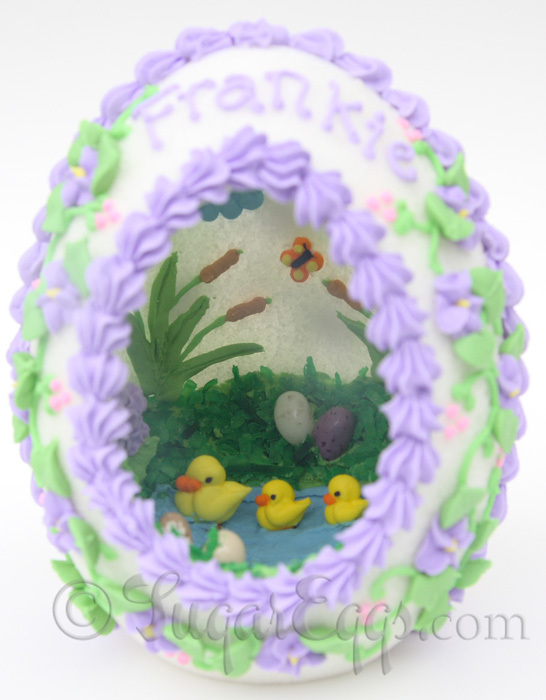 *Traditional panoramic style (window in the tip of the egg) also available. The eggs are made of pure cane sugar (what more can a child want? 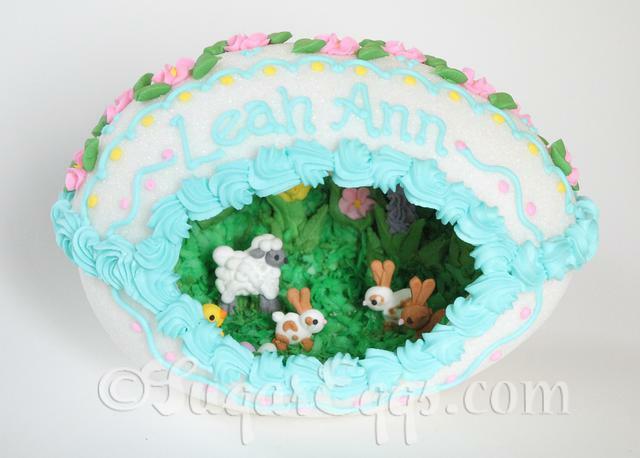 ), decorated with royal icing, and the green "grass" inside is made from coconut. 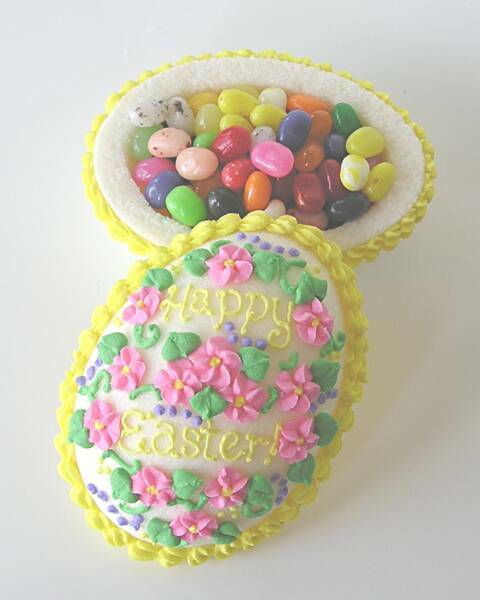 Keeping with tradition, the decorations inside are edible in nature, carefully handcrafted icing decorations, animals, flowers, and jellybean eggs; for older children and adults I can also use miniature figurines, silk flowers, or collectibles by request and availability. They are intended for decorative purposes only. Large- 6" x 4.5" x 4"
Medium- 4.5" x 3.5" x 3"
Small- 3.5" x 2.5" x 2.5"
Can you keep them? If so, how do you do it? SugarEggs can last years, decades even, when properly cared for. As long as you keep them safe from the main two dangers (moisture and hungry children), you can keep them for years to display and treasure. For best preservation, keep out of sunlight and away from any moisture. Humidity in the air can cause deterioration, they are best stored in a dry environment. Instructions detailing the best methods of preservation will be included with your order. The coconut grass doesn't last as long as the royal icing grass, so that is something to consider. Magic, with a little help from the Easter Guru himself, the Big Bunny! 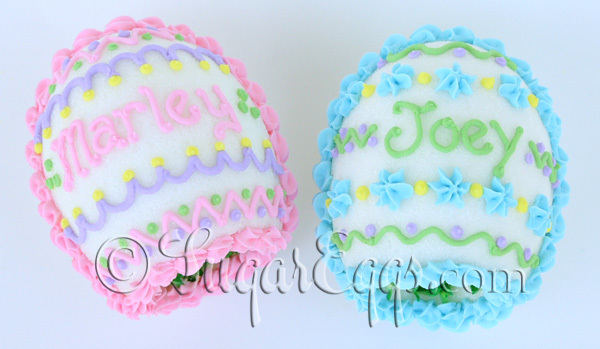 Each Sugar Egg is painstakingly handcrafted. Much time is spent making each individual egg perfect-these are not a mass-produced item! We make all the icing decorations inside and out by hand, and the creation process for a Sugar Egg start-to-finish requires several days. Each egg is individually shrink-wrapped, carefully insulated in bubble-wrap and packaged securely. Guaranteed to arrive in one piece! Shipping is via USPS Priority Mail. One or two small eggs pr one medium egg will ship anywhere in the US for $7. One large egg or two medium eggs ship for $9. Four mediums or two larges ship for $14. Prices for larger quantities are the actual shipping cost, determined by the total weight and zone. The Sugar Egg I would like to order is a gift, can you send it to the recipient? No problem! No invoice will be included, only a sheet on the care and history of the Sugar Egg tradition and colored Easter grass fluffing up the package. Extra wrapping may available for an additional charge. What Icing Colors are available? Pastel colors - pink, soft blue, soft green, yellow, lavender, aqua, & white are included. Other colors such as orange, brown, or primary hues (red, dark blue) are available but an additional charge will apply if we have to create a batch of icing for custom colors. What do you use inside the Panoramic Eggs to make the inner scene? 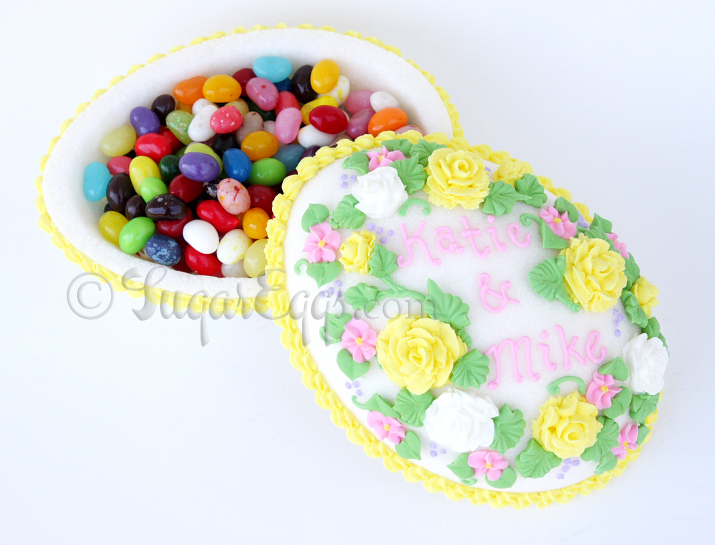 We painstakingly craft our own edible hand-iced decorations (bunnies, ducklings, lambs, flowers and butterflies), we can also use small resin Easter figurines (bunnies, chicks, ducklings, and lambs), silver or pewter crosses, charms, gourmet jelly beans, iced or silk flowers, and shredded coconut 'grass'. Resin/ceramic figurines only on an as-available basis. I can't begin to decide on the options, can you just design a Sugar egg for me? No problem! All the choices available can be overwhelming-if you would prefer just to specify basics we would be happy to design an egg for you. It would help if you specified an age/gender or favorite color to give a starting point, but however much (or little) you want to suggest is fine. 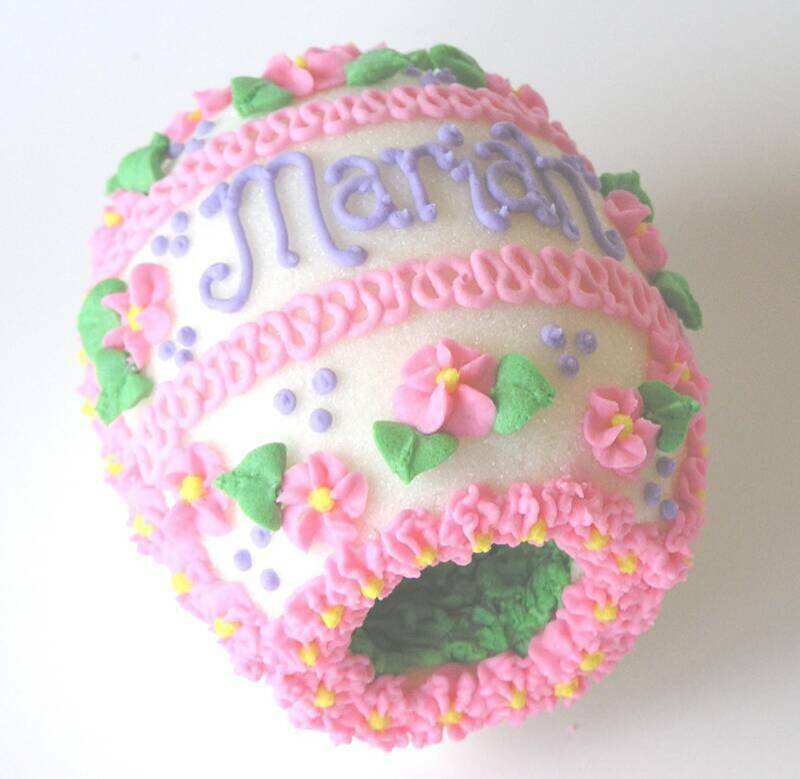 Can you make a non-Easter themed Sugar Egg? Definitely! We have made eggs with different themes, ranging from Christening, birthday, sports, ballerina, fairy, horse & western, wedding/bridal, to Star Wars! If you have an idea about something that you don't see offered, please send an email detailing what you would like. If these require unusual icing colors or custom figures for the inside, additional charges will apply.